Today’s global economy has grown enormously competitive and aggressive. In order to survive in this business, it is necessary to achieve quality assurance methods because quality is what the customer demands. Our commitment to quality begins with the people that we employ and continues through to a project&apos;s completion. We work hand in hand with our clients and engineers to ensure that the development and all aspects of the projects are completed to specification. Total quality management can be summarized as a management system for a customer-focused organization that involves all employees in continual improvement. It uses strategy, data, effective communications and involvement of all level employees to integrate the quality discipline into the culture and activities of the organization. 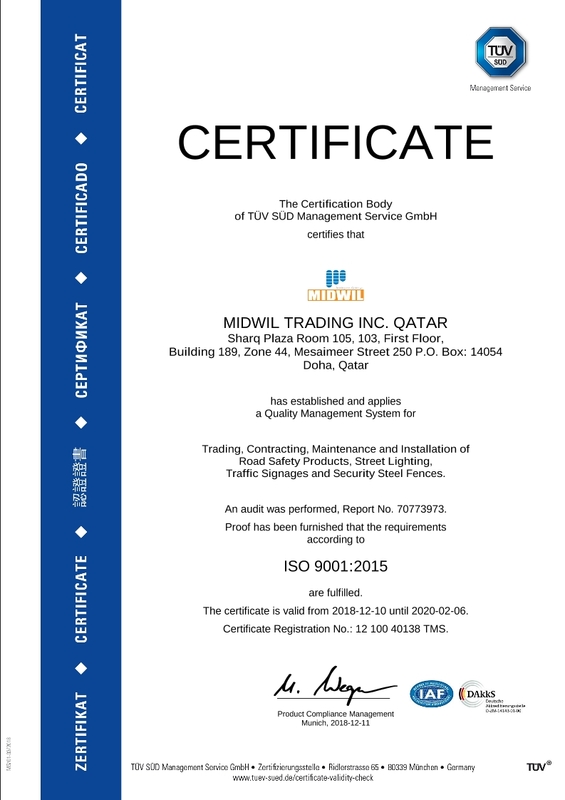 Our company, MIDWIL Trading Inc. – Qatar, has been certified to ISO’s management system standards (ISO 9001:2008) since year 2010, with the purpose of improving the efficiency and effectiveness of our operations. In February 2016, MIDWIL Trading Inc. – Qatar, has established and applies an Environmental Management System (ISO 14001:2004), and Occupational Health and Safety Management System (OHSAS 18001:2007) as certified by TUV-SUD Management Service GmbH. These certifications grant recognition that our company and our products are safe, of high quality, and has meet the established criteria.